If you think a formula is missing here but required in PMP exam. Post a comment and we will add to this table. Values for the TCPI index of less then 1.0 is good because it indicates the efficiency to complete is less than planned. How efficient must the project team be to complete the remaining work with the remaining money? Net Investment / Avg. Annual cash flow. #14 Present Value formula is incorrect. As written the formula only works for 1 year. For the sake of completeness, I guess it would be better to include the Six Sigma value too. 1/CPI where CPI = Cost performance Index. I just checked the MDAS rule and after this i got know that it is true.Any how tahnks for recommending. May I know some one maintaining these formula's and updating for PMBOK4. 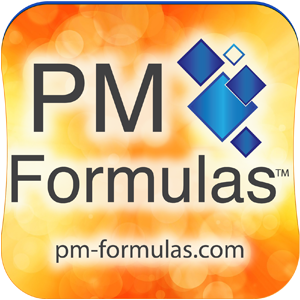 also I want to know How many Formula's are in Total in PMBOK4 and can someone please share if already got it. Can you pl. be more specific how this question is related to PMP? I learned this in a class I took.I thought I would share. This is really helpful ! Thanks for compiling !! AND IN ABOVE LIST IT IS -50/+100 %, I THINK IT WAS IN PMBOK 3. This is a great summary and thanks for putting it together. Is there any excel sheet or printable version of these formulae. You have received estimates for one of your project tasks as follows: The Pessimistic estimate is 32 days, the Optimistic estimate is 26 days, and the Most Likely estimate is 22 days. Using this information, calculate the range of Finish Dates for this task with a certainty of 99.999 percent (6 STD). Step 3. Determine Standard distribution against the required probability. 24.33 -/+6 = from 18 days to 30 days (approximately for this case). but can u suggest what is the best way to remember the formulas. I think, the best way for understanding and memorizing the formulas, other rules and principals is using them on your projects; alternatively, mentoring and sharing your thoughts with others. I also found a very useful community that helps you to understand sophisticated questions and allows sharing your ideas. I am wondering, where did you find these formulas? They don't exist at all in the PMBOK 5th edition! How do they come in the exam if never been mentioned in PMBOK ! PMI advocates a number of approachs that start in an assortment of professional territories. So while these systems may appear to be different, they are considered piece of the aggregate entirety.